What is the issue? What is the goal? What are the anticipated results? The Green Project NGO tries to raise awareness among citizens and related stakeholders all over the world, about the need for conservation of areas with significant cultural and ecological importance. It attempts to unveil the importance of culture for the conservation of biodiversity and sustainable use of environmental resources. Its aim is to create a platform where technology innovation and traditional knowledge will find a place to interact, a hub where ideas can be exchanged in order to achieve a future worth living. In Australia, the growth of renewable energy has been simply, breath-taking. It has been suggested that with sufficient public/private sector investment and strong government policy support, Australia could switch entirely to renewables within the next decade. This could be done by developing large-scale solar and wind power systems, upgrading the transmission infrastructure and introducing energy efficiency measures. Moreover, Australia has 16 natural sites of UNESCO and 14 Biosphere reserves, designed under the UNESCO’s Man and the Biosphere Program, to preserve examples of the world’s major ecosystems where humans live alongside nature in a sustainable way. Aborigines are Australia's indigenous people who migrated from somewhere in Asia at least 30,000 to 45,000 years ago. Though they comprise 500–600 distinct groups, aboriginal people share a common understanding, strong spiritual beliefs that tie them to the land, as well as a tribal culture of storytelling and art and, like other indigenous populations, a troublesome colonial history. Celebrating the “European Year of Cultural Heritage” (EYCH 2018), the Green Project organises the “Platypus trail: Green Project in Australia - Renewables, Biospheres and Aborigines”, with the goal to make the past meet the future and raise public awareness about the importance of combining the Renewable energy technology innovation with the UNESCO Biosphere reserves programme and the traditional environmental knowledge of Australian Aborigines. The Australian best practices could become a valuable source of experiential information that provide important insights for international funds to invest in clean energy in Australia, and for Greek experts to plan an effective strategy to develop Renewables in Greece, as well as to prevent environmental disasters like the wildfires which devastated Attica, recently. The Green Project 15-member experienced crew team of distinguished scientists and artists is led by Dr Yannis Tzortzis, an Attorney at Law at the Regulatory Authority for Energy, Greece, a Member of the Royal Photographic Society of Great Britain, and Dr Theo Anagnostopoulos, an Ashoka Fellow, science-communication expert, both of whom have an extensive track record on road journeys crossing four continents, recording “green points” of environmental interest. 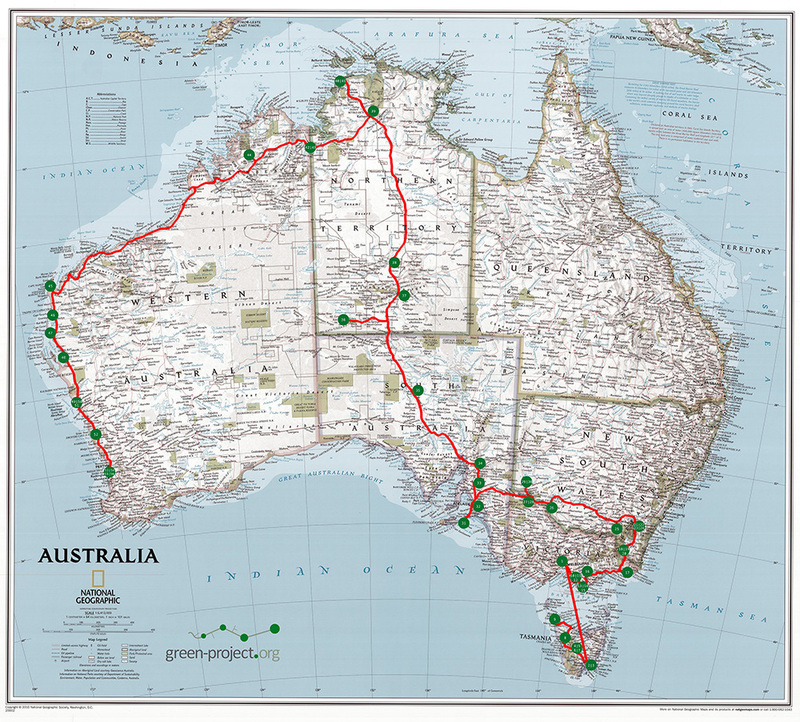 From 4/8 to 2/9/2018, the Green Project delegation will embark on the 11.210 kms “Platypus trail” connecting Biosphere reserves, UNESCO sites and renewables, passing through Melbourne, Hobart, Canberra, Adelaide, Alice Springs, Darwin, Broome and Perth. The crew team is going to visit and record 43 state-of-the-art renewable energy installations, as well as 9 Biosphere reserves and 4 natural sites of UNESCO, where the Aborigines’ presence has been most profoundly evident, throughout the years (see below map 1). The Green Project will explore the human journey of Australian Aborigines like Anangu, who reside within the Biosphere reserves next to renewables, and look into their indigenous philosophy, tjukurpa, which supersedes all aspects of life, from ecosystem management and social relationships to personal identity. The team will try to capture the Aborigines’ daily activities and socio-cultural/spiritual values so as to understand how and if they have achieved to balance their needs with the preservation of the natural environment. Innovative documentary and photo material will be produced and broadcasted through different educational and social media channels, world-wide. This Green Project initiative has been placed under the auspices’ of the Hellenic Ministry for Foreign Affairs, the Australian Embassy in Greece, the UNESCO Regional Bureau for Science and Culture in Europe, the Hellenic National Commission for UNESCO, the General Secretariat for Greeks Abroad (kind support), the Greek Community of Melbourne (the Greek Centre for Contemporary Culture), the City of Athens, the Goulandris Natural History Museum, Athens, the Michael Cacoyannis Foundation, Athens, the Centre of Renewable Energy Sources, Athens, the Hellenic Wind Energy Association, the Hellenic Centre of Photography, Athens, the Hellenic Alumni Association of the LSE. The kind sponsors are NIKON Damkalidis SA Athens, FUJIFILM Doha Qatar, RentPhotoVideo, Athens, and ARGO Fishop Melbourne. Main communication sponsors are the television & radio Hellenic Broadcasting Corporation (ERT, ERT World, First Radio Programme and Voice of Greece), as well as the Neos Kosmos, Melbourne, the Naftemporiki, Athens, Aephoria and Elculure, newspapers & websites. What does the project tell us about human beings and the way human societies shape and are shaped by the environment around them? Human beings are an integral part of the Biosphere reserves, the UNESCO sites and the Renewables’ installations. Since 1972, the Man and the Biosphere Program has been concerned with the interface between human activity and the rest of the Biosphere, or the relationship between humans and nature. Through the “World Network of Biosphere Reserves” (WNBR), 610 biosphere reserves in 117 countries (2013) were designated by national authorities. Biosphere reserves consist of site-specific examples of how humans live with nature in a sustainable way. Each Biosphere is responsible to protect the natural ecosystems and biodiversity, via scientific, educational and participatory projects, while also promote innovative economic development that is environmentally sustainable and socially/culturally appropriate. This project will focus on the presentation of human stories and specifically from Aboriginal people who live in 9 Biosphere reserves and 4 natural sites of UNESCO, which have been chosen as the most representative of the Australian landscape. Namely, i) the Mornington Peninsula & Western Port, ii) the Wilson Promontory, iii) the Croajingolong National Park, iv) the Ningaloo Coast and v) the Shark Bay of marine ecosystems; vi) the Tasmanian Wilderness and vii) the Kosciuszko National Park of glaciation and alpine areas; viii) the Hattah-Kulkyne National Park, ix) the Barkindji and x) the Riverland of riverine and semi-arid areas; xi) the Uluru (Ayers Rock-Mount Olga) of the most important droughty lands in the world; and xii) the Kakadu National Park, and xiii) the Prince Regent River of tropical dry or deciduous forests. The history of Aboriginal Australians is thought to have spanned 30,000 to 45,000 years. This project aims to shed light on the journey of these people, whose social and cultural evolution is influenced by the physical constraints and opportunities presented by their natural environment. Through unique cultural adaptation to the adverse conditions, they have developed social groups based on semi-permanent water sources with reciprocal rights of access over plants and animal resources in the intervening areas. This adaptation is of outstanding and universal value . Nowadays, hunting and gathering is widely thought to be a thing of the past in terms of human socio-cultural evolution. Yet the Aborigines represent one of the very few contemporary hunting and gathering cultures that still exist. Their adaptation is even more significant if we think of the colonial settlers’ failure to devise a viable alternative in the same environment. The project tries to highlight the way that Aboriginal people use the land in a sustainable manner and to record through their personal stories their knowledge of plant and animal species. The contribution of the Aboriginal knowledge is vital to the undergoing research regarding plans for the re-introduction of species that have become locally extinct since the European colonization of central Australia. Research: To answer important scientific questions with measurable outcomes to advance the field of environmental knowledge. Conservation: To achieve quantifiable conservation outcomes as a result of scientifically informed actions. Storytelling: To reveal the diversity and complexity of our world through visual (photography and video), written and audio media. Education: To break new ground for teaching within the lens disciplines or assessing what works in the education landscape. Technology: To benchmark new renewable energy technologies and innovative uses of existing technologies for science, conservation, education, mapping, or storytelling. Introducing the project, including the issue or topic that we want to address (e.g., research question, conservation need, education or storytelling focus). Why it is important and how it is unique. Relevant literature, media coverage, or previous work citing where applicable (including citations in the Bibliography/Works Cited section below). Australia is both rich and unique; between 7 and 10 per cent of all species on earth occur in Australia. Nutrient-poor soils, natural climatic variability, high fire frequencies and a generally flat topography are some of the characteristics that are recognized at Australian biodiversity. There is a great interest about Australia’s terrestrial and marine biodiversity in a national and global sector and the latest years there has been established for its conservation and sustainable use. Regarding, the project’s unique point, apart from its topic, is also the methodology that will be used. Storytelling will function as the mean between the Aborigines and the audiences, to transmit in an interesting and memorable way their sayings. Special attention will be given especially to the young people of the tribes, to illustrate their stories regarding the strategic meaning of their lives inside the boundaries of the above Biospheres and the close relation that exists between their culture and the conservation of biodiversity. The project aspires to visualize the Aborigines’ methods and personal experiences on how their socio-cultural and spiritual values promote the preservation of biodiversity. 3. Why Green Project and UNESCO are uniquely positioned to facilitate this work? Dr Yannis Tzortzis and Dr Theo Anagnostopoulos are the Co-Founders, the President and the General Secretary respectively, of the Green Project, a non-profit organization, established in 2008 by a voluntary initiative of active citizens, scientists and artists, inspired by UNESCO’s “World Solar Programme 1996-2005”. The Green Project has a unique and extensive experience in the implementation of environmental photo journeys and the film production. In 2018, the European Year of Cultural Heritage, where the past meets the future, the “Platypus trail: Green Project in Australia -Renewables, Biospheres and Aborigines” will be the fifth in a series of “green journeys”, worldwide. Yannis and Theo have led an experienced Green Project team of experts and already conducted four road trips, to explore and record important aspects of the human journey: a) in Asia (2008) from Athens to Beijing, from the silk roads to the energy routes, b) in Africa (2010) from Athens to Cape Town, through the waterways of energy, c) in Europe (2012) from Athens to North Cape, along the north – south energy interconnections, d) in South America (2014) from Bogota to the Land of Fire, from geodiversity to biodiversity, and e) in the Ionian Sea (2017) a green photo cruise to unexplored marine ecosystems. During the above “green photo journeys”, there have been recorded on site, green points of environmental interest, i.e. best practices in relation to modern renewable energy sources and traditional energy knowledge as embodied in the sites of the UNESCO World Heritage List. Until today, 39 experts have travelled through 4 continents, conducting 5 journeys, a total of 62,515 km and 809 nautical miles, in 44 countries, using 6 low CO2 emission vehicles, 1 sailing boat and various means of public transport. Green Project has managed to produce original photo/film material on issues such as the tackling of energy poverty, the development of energy tourism, and the promotion of communication between different cultures, which nevertheless, have common environmental concerns. The organisation seeks to raise social awareness through environmental photography and film that could stand out through its authenticity. Its documentary film “SUDAMERICA: The colors of life” has been selected to be presented in “Athens Documentary Film Festival 2018”. In recognition of the above, the Green Project has been presented as “Best Practice” by the Hellenic National Commission for UNESCO in the Annual Report of National Commissions of 2014. Additionally, the Green Project has been awarded the "First Award 2014" of the "International Photo Competition" of the "Energy Community", Vienna, Austria, the “First International Participation Award” of the “Festival de l’ Image Environnementale 2010” in Paris, France and the “Third Award for the Clean Development Mechanism” at the “United Nations Framework Convention on Climate Change 2010” in Cancun, Mexico. We believe that the UNESCO Regional Bureau for Science and Culture in Europe, the Hellenic and Australian National Commissions for UNESCO, as well as the Green Project are the most appropriate institutions to facilitate our project since their objectives coincide. Specifically, UNESCO inspires people worldwide, to explore our planet and share their experiences by using powerful images and storytelling. The Green Project’s video broadcasting uses the power of visual storytelling in an excellent way creating a compelling social presence. The contribution of UNESCO and the Green Project in the project will immensely strengthen the dissemination impact we aspire it to have, worldwide. The videos that are going to be produced, depending on the material recorded, could either be a full-length documentary, or a series of short clips. The Green Project expertise on video production, could prove extremely valuable to create high quality digital educational material, maximizing the impact of this work globally. In line with this, we propose the optional supervision on the production of the core videos of this project by a video broadcasting company, upon agreement. If the required controls are met, the dissemination of these videos could be also maximized through UNESCO and the Green Project platforms. What do we plan to accomplish with the project? 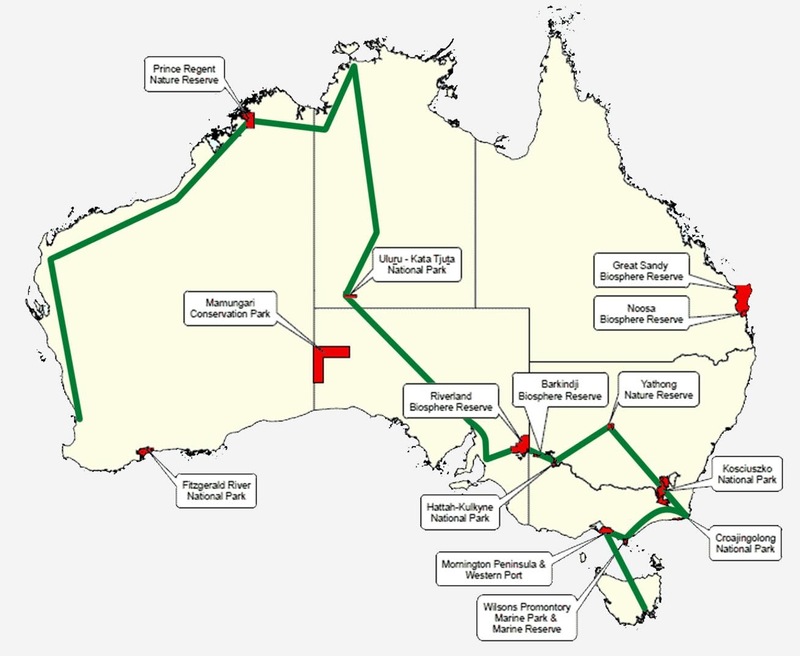 This project is a “green journey” through 43 unique examples of Renewable energy sites, 4 National Parks and 9 of the most important Australian Biosphere reserves, where Aboriginal people live. An ambitious team consisting of 15 leading experts, scientists and artists, will conduct a road trip towards one of the most challenging destinations ever planned. During the 1st UNESCO 2017 MAB Youth Forum that took place in Delta del Po, a Biosphere reserve in Italy, the existence of a “knowledge gap” about Biosphere reserves and their significance for conservation and development was highlighted. The main objective of the present project is to fill this “gap” and to promote public awareness on preservation of the identity and the cultural and historical heritage of the above regions (local dialect, customs, local products and flavors, cultural landscape). The key objective is to enhance both the biodiversity and socio-economic development activities, so as to facilitate the ability to perform multiple territorial functions and gear towards a sustainable development. The present project aims to reveal pieces of valuable knowledge on biodiversity management systems used by the locals that could potentially increase the flow of important information about environmental conservation from the local communities to outside stakeholders. The present project will explore and capture the Aborigines’ stories about the model of land management and approaches of sustainable development, based on their indigenous philosophy, “tjukurpa” (law), as well as will highlight the role of the indigenous people in conservation activities. For dissemination purposes, the original material produced, (short videos, full-length documentary and photographs), will be communicated to public worldwide, via art exhibitions, science festivals, film shows, books, online platforms on the internet and specially dedicated social media channels, to exchange information, and provide education about the importance of the Renewables cutting hedge technology, the Biosphere reserves and the Aboriginal peoples living in them. Details of the methods to be used to complete the project, noting any special or unusual tools or techniques we plan to employ. Explanation of our selected methods over possible alternatives. Indication of which populations, communities, and/or locations will be targeted with this project. The anticipated number of participants/subjects. We are going to employ hand-held camerawork which is one of the most powerful tools a filmmaker has to communicate with his/her audience. The visual aesthetic of the project has already been planned out. Hand-held camera technique allows the omission of certain equipment that affects the project's production value. This technique will create the proper mood, while also fitting within the necessary budget. The project will require constant movement and it will take us to places we wouldn't otherwise go; such as deep into the woods, the bushlands, or the desert. It's hardly surprising then, that the project is one of hand-held camera's most vocal supporters. Logistically, it's much easier to have a camera that fits into small places, or it can be moved over long distances on foot rather than a full rig encumbered by weight and size. Last but not least, hand-held is the best way to go on low profile and keep our shots discreet, without disturbing the people or the nature. As explained above, we target to visit 43 Renewable energy sites and to explore 9 Biosphere reserves and 4 UNESCO natural parks in Australia, examining the Aborigines’ communities living within their boundaries. At the preparation stage, a team of experts will collect all the available data about the subjected populations and the balance achieved between their culture and the local biodiversity. Although we shall specifically focus on the Aborigines peoples of Boon Wurrung, Bunurong and Gunaikurnai (Wilson Promontory Biosphere reserve), Latje-latje (Hattah-Kulkyne National Park Biosphere reserve) Barkindji (Barkindji Biosphere reserve), Anangu (Uluru, Biosphere reserve), Ngarinyin and Dambinangari (Prince Regent River Biosphere reserve), our findings will have much greater implications. For example, the Anangu people living within the Uluru Biosphere reserve, speak the dialects of Pitjantjara and Yankunytjatjara which are being spoken far beyond the boundaries of the reserve. Furthermore, there are maps of Uluru capturing evidence of pawprints and tracks that represent “tjukupra” stories and how these people comprehend the environment around them, according to their law. Key features of our overall approach include a careful selection of 15 team members. Collaborative approach and flexibility will be considered essential to ensure the success of the project not only during its implementation, but also after its completion. An excellent match has been achieved as following: the team will consist of: Dr Yannis Tzortzis, Attorney at Law at the Supreme Court, Regulatory Authority for Energy, Greece, Member of the Royal Photographic Society of Great Britain and Film Director, Dr Theo Anagnostopoulos, Communication Expert and documentary’s presenter, Dr Aggelos Katsaggelos, Professor of Electrical Engineering και Computer Science, Northwestern University of Chicago, Ms Maria Vranopoulou, Historian, Cultural Anthropologist and Script Writer, Mr Jason Tavlas, Journalist Hellenic Broadcasting Corporation (ERT), Sound Technician, first Cameraman, Mr Alekos Markellos, Journalist, Hellenic Broadcasting Corporation (ERT) Correspondent in Australia, Film Producer, Ms Emma Papaemmanouel, Journalist, Hellenic Broadcasting Corporation (ERT) Correspondent in Australia, Mr Dimitris Paterakis, Civil Engineer, Photographer, second Cameraman, Mr Kostis Vardas, Education Expert, Photographer, third Cameraman, Ms Katerina Charterou, Pharmaceutical Marketing, Ms Sandy Vergitsi, Traditional Medicine Expert, Ms Valeria Kaltezioti, Molecular Biologist, Ms Kassiani Kaltezioti, Interior Designer, Ms Vassiliki Kassoumi, Medical Scientist, and Mr Yannis Anastasopoulos, Food Enterpreneur. The present project planned to be conducted in close collaboration with the Hellenic Ministry for Foreign Affairs, the Hellenic Ministry for Environment and Energy, the Australian Embassy in Greece, the Hellenic and Australian National Commissions for UNESCO, and the respective Biosphere Reserves Managing Authorities. Specifically, Ms Kylie Walker, the President of the National Commission for UNESCO in Australia together with Mr Philippe Pypaert the Biosphere Programme Specialist, UNESCO Regional Bureau for Science and Culture in Europe will facilitate access to all the Biosphere Reserves. There is a strong backstopping support team for the project, to secure the best possible outcome. This team includes, among others: Dr Sotiris Kapellos, Director Operation & Development & BoD member - ELPE Renewables / Chairman - Hellenic Association of PV Companies, Mr Panagiotis Ladakakos, Managing Director in companies of the ENTEKA Group & President of the Hellenic Wind Energy Association (HWEA), Electrical Engineer specialist in Renewable Energy Systems and Electrical Networks, Mr George Ageridis Director, Centre of Renewable Energy Sources and Saving, Athens, Dr Dimitrios Theodossopoulos, Professor of Social, Political and Environmental anthropology, University of Kent, Mr Manolis Moressopoulos, Director of the Hellenic Centre of Photography, Art Curator, Athens Photo Festival, Ms Christiana Kazakou, Fund Raising Co-ordinator, Green Project, Ms Konstantina Konstantinou, Script Writer, Green Project Route Co-ordinator, Mr Christos Grammatikopoulos, Biologist, Green Project Communication Co-ordinator, Mr Filippo Mavrothalassitis, Social Media Co-ordinator, Green Project, Ms Katerina Cheiladaki, Photo Editor, Mr Dimitris Koukouvanis, Montage Maker, Mr Tasos Kouvellis, Animator, etc. A well-designed day-by-day schedule has already been laid out (see below chapter 11), since there are significant factors such as long distance and restricted accessibility to be considered. The project team is going to fly from Athens, Greece to Melbourne, Australia, and then, use camper vans with solar panels to travel along its east to west “Platypus trail”, and fly back to Greece from Perth. The whole journey is expected to last approximately 29 days and cover 11.210 kms. The local liaisons achieved will assist the team of experts to get access to the Biosphere reserves. Our implementation approach will be knowledge-based, i.e. based on the experts’ long-time experience in conducting similar green photo journeys, worldwide. Tribes’ members will provide their personal accounts on how tribal law has affected their lives and the understanding of the role they play in the preservation of biodiversity. The approach of the documentary making will follow the principles of participant observation. The team of experts will focus on the experience of “immersing” themselves in “participating” in the lives of their informants, sharing with them, their everyday routines. What are the expected results of the project? How do we plan to measure them? How do we plan to disseminate our results, and to whom? The main objective of the present project is to present in an aesthetically unique way, a case study of Aborigines’ lives within four Australian Biosphere reserves. The original material produced should enrich our knowledge on how Biosphere reserves really work. The project aims to produce and broadcast original audiovisual material. Film: Creation of a full length high quality documentary about Aborigines’ everyday stories on preserving our shared heritage. These human stories of the Aborigines will be communicated worldwide in order to demonstrate the benefits of combining sustainability and tradition. Versions of this material may also include small episodes of every day shootings. Photos: The project aims to awaken social conscience through environmental photography with an attitude. A communication plan that will guide the messages to a project’s affected stakeholders is a critical part of any project. According to this, the film produced will be disseminated online, via TV channels and other social media platforms for the audience of UNESCO. Α specially dedicated online channel will be used for the Biosphere’s dissemination and educational activities. Additionally, it is going to be presented to several events such as press conferences, art exhibitions, science symposia and film festivals in order to disseminate the results to targeted audiences like local stakeholders, institutions and other organisations, locally and globally. 05.08.2018: Ceremonial start, press conference, opening of the moving environmental photo exhibition “Sailing to inner habitats” and presentation of the Green Project’s documentary film "SUDAMERICA: The colors of life" in the Greek Centre for Contemporary Culture, Melbourne, Australia. 02.2019: “Thessaloniki International Film Festival 2019”, first showing of the project’s documentary in Greece. 06.2019: “International Athens Photo Festival”, journey’s photo exhibition in Michael Cacoyannis Foundation, Greece. 08.2019: Presentation of the project’s photos and documentary in the Greek Centre for Contemporary Culture, Melbourne, Australia. How does our project contribute to the social or professional development of institutions, communities, or individuals through training, mentoring, education, media outreach, or other methods? Who will benefit from our project? The Hellenic Ministry for Foreign Affairs, the Hellenic Ministry of Environment and Energy, the City of Athens, the Australian Embassy in Greece, the Greek Community of Melbourne (the Greek Centre for Contemporary Culture), the UNESCO Regional Bureau for Science and Culture in Europe, the Hellenic National Commission for UNESCO, the General Secretariat for Greeks Abroad (kind support), the Goulandris Natural History Museum, Athens, the Michael Cacoyannis Foundation, Athens, the Centre of Renewable Energy Sources, Athens, the Hellenic Wind Energy Association, the Hellenic Centre of Photography, Athens, and the Hellenic Alumni Association of the LSE, Athens, have placed this project under their auspices, exactly because they strongly believe that it is a very important public diplomacy event, which promotes the development of effective capacity building measures for the understanding and implementation of the World Heritage Convention and related instruments. The kind sponsors include NIKON Damkalidis SA, Athens, FUJIFILM Doha Qatar, RentPhotoVideo, Athens, and ARGO Fishop, Melbourne. Moreover, the television & radio Hellenic Broadcasting Corporation (ERT, ERT World, First Radio Programme and Voice of Greece), as well as the prestigious Neos Kosmos, Melbourne, Naftemporiki, Athens, Aephoria and Elculture newspapers & websites are our main communication sponsors, which will ensure that the project will have the widest possible publicity and dissemination impact. Indeed, the project’s series of short clips and/or the documentary can contribute to the social development of institutions and communities worldwide through media outreach. This can be the starting point for meetings to discuss the progress and new initiatives, carry out small scale research projects and organise training courses for capacity building about Biosphere reserves and the Aborigines. to maintain indigenous cultural values and conservation of biodiversity. The Green Project is a multi-year effort, within which the present project fits. As mentioned above, the present project following Asia (2008), Africa (2010), Europe (2012) and South America (2014), Ionian Sea (2017) will be the sixth in these series of “green photo journeys”, worldwide. At this point we can say that the exploration of the Australian Renewable energy sites, Biosphere reserves in relation to their Aborigines inhabitants, will come up with future topics related to biodiversity and cultural diversity. Biosphere reserves are places where innovative ideas for sustainable development are tested and implemented. The “World Network of Biosphere Reserves” enhance experiences and ideas within countries, continents at the global level. The material produced through the present project will be available for future use, since due to the aforementioned “knowledge gap”, there are many unknown cases from the field to be explored and many untold stories to be recorded. From this point onwards, we shall be planning the “participant observation” of yet more Biosphere reserves worldwide; discover their unique characteristics, the way that Indigenous people inhabit their ecosystems, and in particular, to what extent this intrinsic relationship has been affected by factors like rapid societal change, increasing globalization and economic development. Via this project, as well as the next one in Antarctica, Alaska and Japan, we would mainly like to serve the vision of the Man and the Biosphere Programme (MAB), which establishes Biosphere reserves as demonstration areas and learning platforms with the aim of maintaining and developing ecological and cultural values and securing ecosystem services for human wellbeing. Furthermore, we aim to maximize the benefits of our established long-term cooperation with UNESCO, as well as foster video broadcasting, disseminate information, create interest and promote understanding of Renewable energy sources and Biosphere reserves, by filling up the above “knowledge gap”. Modern Renewable energy technology, as well as Indigenous peoples’ wisdom on nature conservation could provide new impetus to developing a global culture of understanding sustainability and enable humans to effectively preserve the biodiversity of our planet for present and future generations. Cultural site of UNESCO: Royal Exhibition Building and Carlton Gardens. The building and grounds were designed by Joseph Reed. The building is constructed of brick and timber, steel and slate. It combines elements from the Byzantine, Romanesque, Lombardic and Italian Renaissance styles. * Ceremonial start, press conference, opening of the moving environmental photo exhibition “Sailing to inner habitats” and presentation of the Green Project’s documentary film "SUDAMERICA: The colors of life" in the Greek Centre for Contemporary Culture, Melbourne, in collaboration with the Greek Community of Melbourne (GCM) and the Greek General Consulate of Melbourne. * Meeting with Tasmania Local Government officials (i.e. Ministry of Energy, Environment, Culture, etc. ), Australian university academics, representatives of the Aborigines’ communities, environmental organisations, artists and photographers. 2. McRobies Gully. Company Name: AGL. Technology: Landfill gas. Installed Capacity: 1.06 MW. 3. Glenorchy. Company Name: AGL. Technology: Landfill gas. Installed Capacity: 1.66 MW. 4. Catagunya. Company Name: Hydro Tasmania. Technology: Hydro. Installed Capacity: 48 MW. 5. Liapootah. Company Name: Hydro Tasmania. Technology: Hydro. Installed Capacity: 83.7 MW. 6. Tarraleah. Company Name: Hydro Tasmania. Technology: Hydro. Installed Capacity: 90 MW. 7. Tods Corner. Company Name: Hydro Tasmania. Technology: Hydro. Installed Capacity: 1.2 MW. 8. Cultural & natural site of UNESCO: Tasmanian Wilderness. In a region that has been subjected to severe glaciation, these parks and reserves, with their steep gorges, covering an area of over 1 million ha, constitute one of the last expanses of temperate rainforest in the world. 9. Woolnorth Stage Ι, ΙΙ, III. Company Name: Hydro Tasmania, Technology: Wind. Installed Capacity: 10.5 MW, 54.25 MW, and 75 MW, respectively. * Meeting with Victoria Local Government officials (i.e. Ministry of Energy, Environment, Culture, etc. ), Australian university academics, representatives of the Aborigines’ communities, environmental organisations, artists and photographers. 10. Clayton. Company Name: Energy Developments Ltd. Technology: Landfill gas. Installed Capacity: 10 MW. 11. Mornington Peninsula. Company Name: Landfill Management Services (LMS). Technology: Landfill gas. Installed Capacity: 0.7 MW. 12. Biosphere reserve: Mornington Peninsula & Western Port. It is also a Ramsar Site, which consists of a coastal embayment incorporating vast relatively undisturbed mudflats with salt marsh vegetation. It is also considered as an internationally important feeding and roosting area for numerous species of summering waders, many of which are listed under the bilateral Migratory Birds Agreements (with Japan and China). The biosphere reserve has Federal, State and Local Government support, taking on a holistic approach to conservation. It is complemented by Mornington Peninsula Shire’s Sustainable Peninsula Initiative, which includes a variety of programmes and activities to achieve sustainable outcomes. 13. Wonthaggi. Company Name: Regional Wind Farms. Technology: Wind. Installed Capacity: 12 MW. 14. Biosphere reserve: Wilson Promontory Marine Park & Marine reserve. It comprises a granite massif with prominent peaks, outcrops and headlands flanked by extensive swamps, dune deposits and beaches. There are a great variety of open-forests (Eucalyptus spp. ), heathlands, closed forest (Acmena smithii), coastal scrub and dune vegetation. Wilson’s Promontory has an early history of Aboriginal occupation dating back at least 6,500 years. The reserve is highly significant to local Aborigines both culturally and spiritually. “Parks Victoria” acknowledges the Aboriginal Traditional Owners of the Wilson Promontory Biosphere reserve. Through their cultural traditions, the Boon Wurrung, Bunurong and Gunaikurnai tribes identify this Biosphere reserve as their Traditional Country. Local communities are active in establishing cultural and spiritual links with the Biosphere reserve and in undertaking site based monitoring. 15. Toora. Company Name: RATCH Australia Corporation. Technology: Wind. Installed Capacity: 21 MW. 16. Maryvale. Company Name: Australian Paper. Technology: Black liquor. Installed Capacity: 54.5 MW. 17. Biosphere reserve: Croajingolong National Park. Large stands of warm temperate rainforests are present in the eastern part of Croajingolong. Coastal heathland and species diversity is comparable to that in the South African Heaths, which are regarded as one of the richest vegetation community in the world outside lowland tropical rainforests. Almost, 1,000 native plant species (90 species of orchids) and 315 animal species have been recorded within the biosphere reserve. The abundance of artefacts and middens within the biosphere reserve indicates a history of occupation by reasonably large populations of Indigenous communities, who most probably concentrated around the inlets, estuaries and wetlands. Mallacoota township, and smaller settlements known as Tamboon South, Peachtree and Furnell Landing are entirely surrounded by the National Park. 18. Biosphere reserve: Kosciuszko National Park. It includes the highest mountains of mainland Australia. It ranges from 213 meters above sea level to 2,228 meters. The alpine area of the park includes a Ramsar wetland. The vegetation progresses from treeless alpine herb fields through sub-alpine snow gum woodlands to montane forests and riparian communities along major rivers. The Biosphere reserve supports a variety of vertebrate species such as the grey kangaroo, the red-necked wallaby and swamp wallaby and wombats. The area has a long history of human use, which includes aboriginal occupation, European exploration, livestock grazing, mining, skiing and the establishment of the Snowy Mountains hydro-electric scheme. There are less than 400 permanent residents in the area, including descendants of aboriginal groups. 19. Guthega. Company Name: Snowy Hydro. Technology: Hydro. Installed Capacity: 60 MW. 20. Jindabyne. Company Name: Snowy Hydro. Technology: Hydro. Installed capacity: 1.1 MW. * Meeting with the Greek Ambassador in Canberra, the President of the Australian National Commission for UNESCO, Federal Government officials (i.e. Ministry of Energy, Environment, Culture, etc. ), Australian university academics, representatives of the Aborigines’ communities, environmental organisations, artists and photographers. 21. Mount Stromlo. Company Name: ACTewAGL. Installed Capacity: 0.7 MW. 22. Tumut. Company Name: Visy Paper. Technology: Black liquor. Installed Capacity: 20 MW. 23. Blowering. Company Name: Snowy Hydro. Technology: Hydro. Installed Capacity: 80 MW. 24. Jounama. Company Name: Snowy Hydro. Technology: Hydro. Installed Capacity: 14 MW. 25. Tumut 3 II - Cooling Water. Company Name: Snowy Hydro. Technology: Hydro. Installed Capacity: 0.72 MW. 26. Biosphere reserve: Hattah - Kulkyne National Park. It consists of a lake system and an extensive wetland with a complex flood hydrology operating on a two to seven year cycle within a semi-arid area connected to the Murray River. There are also dune fields, floodplains and saline flats. When flooded, the lakes become important breeding areas for herons, egrets, cormorants and spoonbills. The area is the traditional home of the Latje-latje aboriginal tribe and contains numerous cultural sites. 27. Colignan Cogeneration Plant (Mildura) - Company Name: Australian Tartaric Products Technology: Food and agricultural wet waste. Installed Capacity: 0.6 MW. 28. Mildura Power Station Stage 1. Company Name: Silex Systems (Solar Systems). Technology: Solar PV (Solar Systems). Installed Capacity: 1.5 MW. 29. Biosphere reserve: Barkindji. The Barkindji are the indigenous Aboriginal people from the north of the Murray River. and permission has been sought to use the name. The bedrock of the basin is over 350 million years old. There is enormous conservation value in the area both in terms of flora and fauna of riverine and semi-arid areas and from a geological, archaeological and cultural heritage perspective. More than 200 rare and endangered species of plants and animals are found within the area. The Barkindji Biosphere is created to reserve projects that will provide employment and training opportunities for local Aboriginal people. There are many sites of Aboriginal cultural heritage in the area and the Barkindji and Respected Elders will continue to be involved in the development of the Biosphere Reserve. 30. Biosphere reserve: Riverland. It is one of the largest remaining continuous stands of ancient mallee (multi-stemmed tree-like Eucalyptus plants that originally grew in many semi-arid parts of Australia) left in the world. Because of this, it is home to a number of rare and endangered species, some of which are no longer found anywhere else on earth. Over 275 bird species, 843 plant species and 79 reptiles and amphibians are recorded. More than 17,000 people (2003) live in the area near the Murray River which is known as the Riverland. River life was once of great significance with turtles, fish, waterfowl and mollusks providing food sources for indigenous groups. * Meeting with South Australia Local Government officials (i.e. Ministry of Energy, Environment, Culture, etc. ), Australian university academics, representatives of the Aborigines’ communities, environmental organisations, artists and photographers. 32. Bolivar. Company Name: South Australian Water Corporation. Technology: Sewage gas. Installed Capacity: 3.5 MW. 34. Hornsdale Wind Farm. Company Name: Neoen. Technology: Wind. Installed Capacity: 315 MW. Tesla, Inc. won the contract and built the Hornsdale Power Reserve adjacent to the Hornsdale wind farm. As of December 2017 it is promoted as the largest lithium-ion battery in the world. Samsung 21700-size cells are used. 35. Coober Pedy. Company Name: SA Government. Technology: Wind. Installed Capacity: 0.15 MW. 36. Biosphere reserve, cultural & natural site of UNESCO: Uluru - Kata Tjuta National Park: Uluru, an immense monolith, and Kata Tjuta, the rock domes located west of Uluru, form part of the traditional belief system of one of the oldest human societies in the world. The Mutitjulu community is the only settlement within Uluru-Kata Tjuta. The Aboriginal use of the land for over one thousand generations is reflected throughout the Uluru - Kata Tjuta landscape. The Anangu people living within the biosphere reserve belong to two main dialects: Pitjantjara and Yankunytjatjara which extend far beyond the boundaries of the reserve. They are engaged as managers, rangers, tour guides and consultants in the area. They use the term “tjukurpa” to describe the pieces of environmental knowledge that have been gained by their ancestors in order to live in harmony with nature. The state of this Biosphere is irrevocably interrelated with the Aborigines, through their religious philosophy. 37. Araluen Arts Centre. Company Name: Araluen Arts Centre, Technology: Solar PV. Installed Capacity: 0.16 MW. 39. Cultural & natural site of UNESCO: Kakadu National Park. The cave paintings, rock carvings and archaeological sites record the skills and way of life of the region’s inhabitants, from the hunter-gatherers of prehistoric times to the Aboriginal people still living there. * Meeting with Northern Territory Local Government officials (i.e. Ministry of Energy, Environment, Culture, etc. ), Australian university academics, representatives of the Aborigines’ communities, environmental organisations, artists and photographers. 40. Shoal Bay. Company Name: Landfill Management Services (LMS). Technology: Landfill gas. 41. Nightcliff. Company Name: Nightcliff Shopping Centre. Technology: Solar PV. Installed Capacity: 1.06 MW. 44. Biosphere reserve: The Prince Regent River. The area, one of Australia’s most remote and beautiful places, in the north-west of Australia, is mainly inhabited and is sporadically occupied by traditional groups of Ngarinyin and Dambinangari who have left many culturally significant art and artifact sites. Vegetation is diverse, although open tropical woodland covers extensive tracts. Vine thickets, fern gullies and mangroves occur in the area. Animal species as rock rinktail possum (Pseudocheirus peregrinus), scaly -tailed possum (Wyulda squamicaudata) and golden bandicoot (Isoodon auratus auratus) are threatened. The Uunguu Native Title claim overlies part of the Prince Regent River Biosphere reserve and joint management arrangements are being developed with the Worara traditional owners. * Meeting with representatives of the Aborigines’ communities, environmental organisations, artists and photographers. 45. Natural site of UNESCO: Ningaloo Coast. The 604,500 hectare marine and terrestrial property of Ningaloo Coast, on the remote western coast of Australia, includes one of the longest near-shore reefs in the world. 46. Coral Bay. Company Name: Verve Energy. Technology: Wind. Installed Capacity: 0.83 MW. 47. Carnarvon Solar Farm. Company Name: EMC Solar. Technology: Solar PV. Installed Capacity: 0.29 MW. 48. Natural site of UNESCO: Shark Bay. At the most westerly point of the Australian continent, Shark Bay, with its islands and the land surrounding it, has three exceptional natural features: its vast sea-grass beds, which are the largest (4,800 km2) and richest in the world; its dugong (‘sea cow’) population; and its stromatolites (colonies of algae which form hard, dome-shaped deposits and are among the oldest forms of life on earth). 49. Alinta Wind Farm (Walkaway). Company Name: Infigen Energy. Technology: Wind. Installed Capacity: 89.1 MW. 50. Mumbida. Company Name: Verve Energy & Infrastructure Capital Group. Technology: Wind. Installed Capacity: 55MW. * Meeting with Western Australia Local Government officials (i.e. Ministry of Energy, Environment, Culture, etc. ), Australian university academics, representatives of the Aborigines’ communities, environmental organisations, artists and photographers. 53. Tamala Park. Company Name: Landfill Gas and Power. Technology: Landfill gas. Installed Capacity: 4.65 MW. 54. Woodman Point. Company Name: WA Water Corp. Technology: Sewage gas. Installed Capacity: 1.8 MW. 55. Perth Zoo. Company Name: Perth Zoo. Technology: Solar PV. Installed Capacity: 0.24 MW. 56. Wave Energy Research Centre. The University of Western Australia, Perth.